Our Memorial is complete! On September 5, 2014 a grand dedication was held. 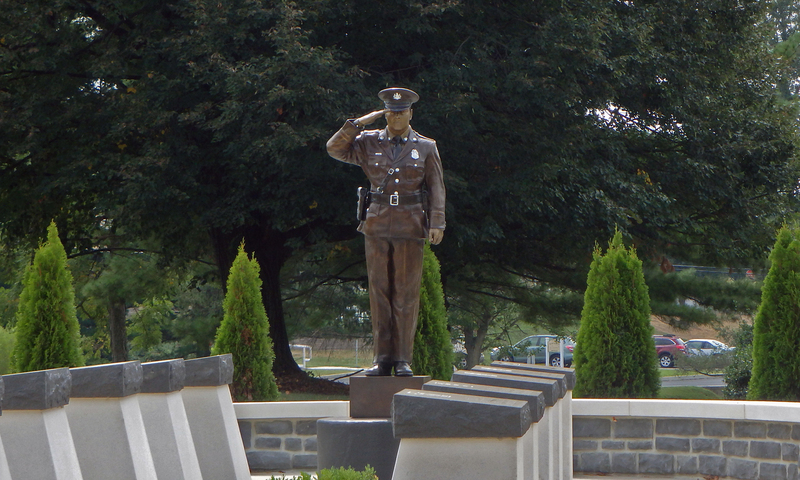 The Cumberland County Law Enforcement Memorial is now a reality. February 6. The first meeting of 2014 consisted of a lot of organizational work. Getting materials ordered for construction to start back up when the weather broke. 2013 tax preparation was complete. Pennsy placed our logo on the side of one of their mixer trucks. An earlier date for the dedication had been made for May. That was moved forward to September. June 14. Precast wall caps and pillars were being installed during this meeting. Board had traveled to Lancaster to check on the statue status. Service, Dedication, Integrity, Pride and Honor chosen. Benches ordered. The name tag on the statue will read HAMGS. Hammon, Anderson, McLaughlin, Gleim and Smee. June 27. Planning continued for the dedication. Bench plaques and bricks are being made. Joel Ramp is ready to do landscaping when we are ready. July 24. Landscape, electrician, mason and general contractor were all present. Flags are ordered. Don Mowery advised us his people were done with their work. They would have the final caulking completed. Discussion regarding the extra area for future memorials. It was decided we would have the shield/rose logo sandblasted into pavers. Lay out for the dedication ceremony was decided. Planning for the dedication continued. Invitations are being printed and mailed. The statues is scheduled to be mounted next week. August 26. Meeting was spent reviewing the dedication plans and working out the final details. At this time we have approximately 100 RSVP’s. September 30. This was the final meeting of 2014. Close to 200 people attended the dedication. It was a great day for Cumberland County Law Enforcement. All final invoices were approved and we now have our Memorial. In total the Board has met for 36 times for official meetings since 2011. Countless side bar meetings, phone calls and emails have occurred during that same time. We have money left for future maintenance of the site. The Foundation will continue to meet on an as needed basis ensure to ensure maintenance and fundraising are done as needed in the future. Sponsor bricks will continue to be sold and other donations will always be accepted. Attached to this report you will find two related documents. The first of which is an article that was written and published on the history of our memorial. The second are some basic thoughts the foundation members have on the future role of the foundation.